Robert Ryman’s earliest known painting is also one of his most anomalous: a 28 1/8-inch square canvas covered in orange oil paint—“such a shocking color,” as Ryman later observed of the painting, Untitled (Orange Painting) (1955/1959).1 “Of course it’s not all the same hue,” Ryman clarified. “There are many oranges in here, there are reds, light oranges, and dark yellows…there are many nuances and many oranges.”2 In sheer chromatic effect, the painting reminds one of Jasper Johns’s Flag on Orange Field (1957), relieved of its representational subject matter. Ryman painted the surface of the canvas as well as the tacking edges, a detail which also links the painting to Johns’s work, especially to the painted edges of his Target with Plaster Casts.3 “If the panels were black or blue or red,” Ryman said in reference to a later white painting, “they would have become a different thing. You would see color and the panels would become more object-like themselves, and more about color. But white is such a neutral situation that when you see it, you’re not thinking white. You’re just able to see something as what it is.”4 Color, when deployed on such a scale, lends a monumentality that approaches objecthood for Ryman, whereas white functions as a neutral situation in which other pictorial events are given precedence. Ryman’s rejection of the conditions of Untitled (Orange Painting) thus set the terms for his work over the next decade: technically specific works on paper or thin supports in which white has replaced color as the mechanism by which Ryman questions the ontological significance of his art. Untitled (1961) is as representative of Ryman’s working methods as Untitled (Orange Painting) is anomalous. Executed in white gouache and graphite on beige wove paper, the work exemplifies the restricted means that often characterize Ryman’s work. 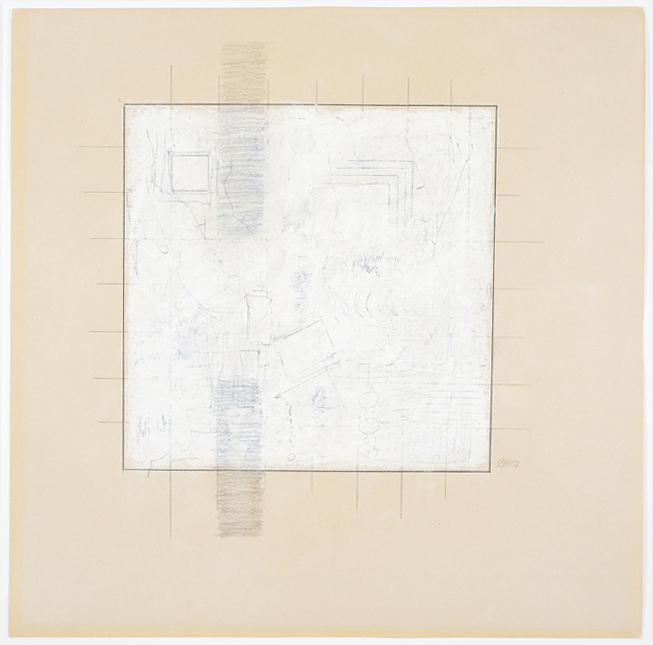 Although Ryman is known for his use of innovative media, his use of gouache–a traditional media for works on paper–and a simple graphite grid in Untitled (1961) serve to underscore the flatness and graphic nature of the piece. Even the graphite forms at the center of the work appear two-dimensional, their outlines hinting at the refinement of form rather than a notation of depth or volume. Yet despite the insistent flatness of the work, Ryman destabilizes the idea of the grid and the monochrome—two seminal ideas of modernism—through his sophisticated layering of media. To create Untitled (1961), Ryman drew a grid in graphite, placed slightly higher than the center of the sheet, and then created circles, squares, rectangles and groups of various lines in graphite within the gridded form. (The only exceptions are the heavily shaded stacks of graphite marks, which appear to have been executed using the side of a pencil.) Using white gouache, a form of opaque watercolor, Ryman then painted over these forms, mirroring the square shape of the grid but stopping short of its irregular edges. Ryman’s use of white gouache over graphite produces a blue undertone through a technique known as scumbling, whereby a thin layer of a lighter color is placed over a darker color in order to soften the color or provide depth. Ryman finished the drawing by adding a sharp, dark graphite edge around the gouache to define the central square and creating additional graphite marks over the gouache. The cumulative effect of Ryman’s multiple layers is one of surprising pictorial depth. “With white,” he explained, “you can see more of a nuance, you can see more… So it wasn’t a matter of white, the color [in my work]. I was not really interested in that. I started to cover up colors with white in the 1950s.”5 It is in the logic of “cover[ing] up,” and the implication of multiple layers, that we gain a sense of the depth of Ryman’s graphic work. This entry was posted in Christina Rosenberger, Robert Ryman. Bookmark the permalink. Post a comment or leave a trackback: Trackback URL.